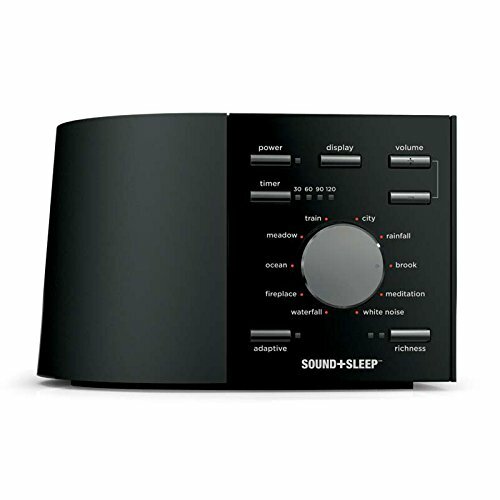 Sound+Sleep is the best sound or white noise machine if you want to go digital. They simply play an ambient audio through built in speakers. About quality or speakers and sound, they are simply unmatchable. Speakers face up and lighten up your room, providing a rich full audio which is like high definition. Quality of audio is extremely high bit rate i.e. 1411 kbps and there isn’t any distortion or clipping. You can choose from 10 different environmental sounds including completely static white noise, ocean, fire, waterfall, brook, meadow, rainfall, train, city and meditation. Every soundscape is composed of many random sound samples and randomizing all to replicate on the continuous sound. So, no loop is heard twice. These sounds were tested, researched and proven to encourage swift relaxation with music composition of audio. 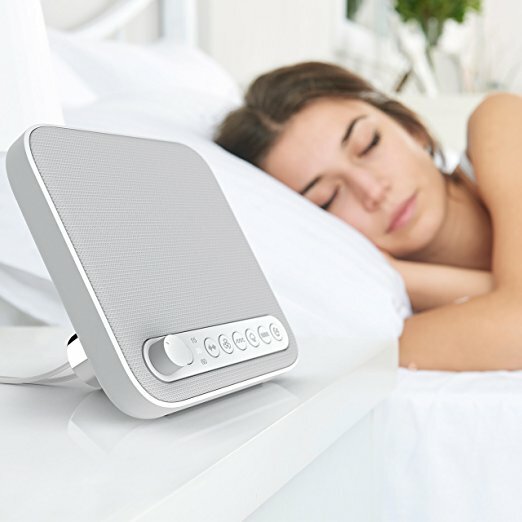 Sound+Sleep uses really cool technology known as adaptive sound which neutralizes all external environmental noises through playing over them. It determine the main frequencies and amplitude of main sounds coming from environment and adjust audio volume to match with it. When there is lots of noise in background, machine play louder in order to mask out all noise. Do not worry, it never abruptly change just like alarm, therefore it will also not disrupt the process of trying to sleep. Sound+Sleep also include an array of other features which makes it one of the best sound or white noise machines which uses digital audio. It includes a timer which gradually fade away audio sample right after 30, 60, 90 or 120 minutes of nonstop play. A button is also there that you can press to enhance audio and inject random sounds to it like a breeze. It adds to overall richness of track. 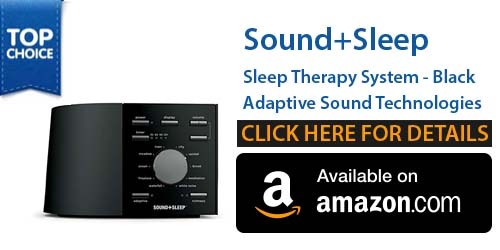 All in all, Adaptive Sound Technologies Sound+Sleep machine is our top pick and we suggest to have it if you have any trouble falling asleep. For more organic touch, Marpac Dohm is best. It is not digital machine and doesn’t use any audio sample to produce sound. It’s pure analog machine that uses fan to create sounds. It is made of plastic and includes slits running on top and side. These slits are adjustable to control sound pitch. It produces sounds mechanically by creating air by fan in center which flows through small slits. Sounds produced is basically white noise that is a whizzing sound and most if not all people agree it is calm static. Its main unique feature is that it doesn’t produce digital sounds that are bit unnatural and cannot completely replicate natural sound. Acoustics of room cannot match digital audios and therefore will not sound right, until you setup speakers appropriately. Whooshing sound produced by this machine is organic and extremely relaxing. But, using this natural sound producing machine will ask you to compromise on many features. First of all you only have one type of sound to listen. No doubt you can change pitch however it is not like having many ambient audio samples to choose from. Many people love the organic sounds, however before getting Marpac Dohm, make sure to check few samples of what mechanical sleep machines sound like. 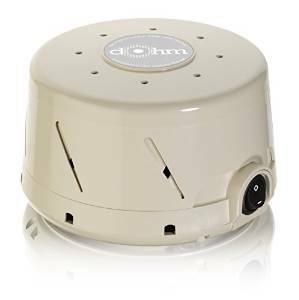 Overall, Marpac Dohm is best organic sound machine that creates soothing sounds. Although it does not come with fancy features like adaptive sound, alarms, plethora of different to opt from, it comes with just one great sound that works well. If you prefer digital sound machines like Ecotones and prefer different audio samples go for Sound Oasis. While we are still in favor of Ecotones, however it is always best to present another contender. About sound quality, its speakers are actually better than Ecotones and produce nice full audio which projects various directions with much clearer high and mids. About collection of audio samples there are only 6 different sounds including ocean, rain, summer night, wind, stream and white noise. All are recorded with multiple takes that are randomized to produce continuous stream. Therefore, these sounds aren’t just looped over and over again. 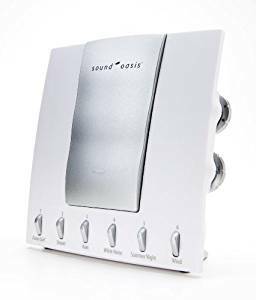 Sound Oasis is full of various nice features which makes it comparable to many best white noise or sleep machines. A knob is also available to control a timer which slowly fades away after 30, 60 or 90 minutes. Sound card is also removable to upgrade your own and improved version. It can be run on batteries therefore you can take it on the road. It even has jacks for headphone therefore you can use it in public places or on flight. All in all, Sound Oasis is best sound machine but constrained by very limited options of audio samples. Sleep perfectly and relax with Wave Sleep Therapy. With 6 different sound settings, one can drown out the distractions and get into peaceful environment which supports rejuvenation and rest. You can choose white noise, rain, summer night, ocean, fan, and stream. This device has compact design that suits well on all sizes stand and at the same time it is modern enough to complement any type of home décor. Integrated speakers and adjustable volume control enables to select volume which is right according to your room size as well as comfort level. There is an automatic shut-off timer to conserve energy when you are sleeping with 15, 30 or 60 minute timer, so you have an energy saving operation. You can charge your Phones and other USB devices while relaxing. Its removable stand’s smart design will help you keep USB and power cord cable organized and clean. 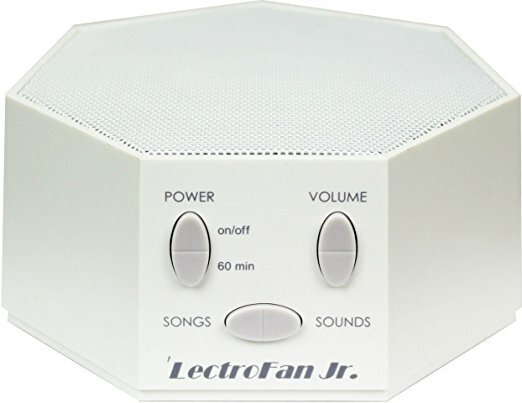 LectroFan Jr. White Noise Sound Machines create unique, non-looping steady sound that are dynamically generated to eliminate distracting loop common in other counter parts. It is equipped with 12 different white noise to deal with all sound masking situations. LectoFan Jr. is also loaded with 18 nursery rhymes, peaceful lullabies to create soothing, fun playtime and sleep environment by reducing neighborhood traffic, household noise, snoring and other unexpected noise while travelling. Its design is simple and safe with no moving or motor parts The compact size and USB power supply is something great to make it perfect for travelling purposes. It is backed with USB power supply.